In the yere of our Lorde 1537 the xxiij day of February, the monasterie of Seynet Gregories was suppressed and the chanons were expulsed; mr. Spilman and mr. Candish (should be Candel) being the kynges commissioners herunto appointed. The same day, the church of Saynet Sepulchre, by the autoritic of the same commission, and by the same commissioners, was suppressed. The moinalls* notwithstandyng at that tyme were not removed, for they obtayned lycence to abyde there untill Easter, which notwithstanding scarlsly (scarcely) remayned one moneth afterwardes; so at the last the weeke before Easter they were expulsed. *i.e. the nuns; misprinted "monks" by Strype, ubi supra. 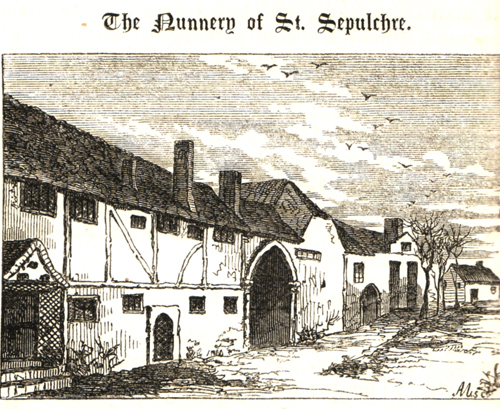 St. Sepulchre's Nunnery, founded 1100, by Archbishop Anselm, in the south east of the city; revenues 38l. 19s. 7 1/2d., now worth 779l. 12. 6d. ; granted, 38 Henry VIII., to James Hale. "...the present road leads by Oaten-hill, into the city through St. George's gate; at this turning stood the nunnery of St. Sepulchre, the gates of which are still to be seen, but of the house very little. "This church* was built by William, surnamed Fithamon, being the son of Hamon, the son of Vitalis, one of those who came over from Normandy with William the Conqueror. This William was no doubt, the patron of this church, which he had built, and most probably gave it to the neighbouring nunnery of St. Sepulcher, where it staid till the dissolution of that house in king Henry VIII's reign, when the patronage of it was granted anno 29th of it, when the nunnery and the rest of the possessions of it to the archbishop of Canterbury, subject nevertheless to the payment of 3s. to the vicar of this church; all which where again reconveyed by the archbishop to the king in his 37th year, in exchange for other premises, and he granted them the following year to the Hales's, lords of the manor of the Dungeon, whose burial place was within this church; since which the patronage of it has continued in the possession of the owners of that manor, down to Henry Lee Warner, of Walsingham abbey in Norfolk, the present patron of it. Upon the decline of the church of St. Edmund of Riding-gate, not far distant, of the patronage likewise of the same nunnery, it was in 1349 united to this of St. Mary Bredin, with the consent of the prioress and convent**. "Founded by Archbishop Anselm; revenues 38l. 19s. 71/2d. at the reformation, now worth 779l. 12s. 6d. ; granted, 38 Hen. VIII., to James Hale." "To the south-east of the city was a Benedictine nunnery, founded by Archbishop Anselm, and dedicated to St. Sepulchre; the revenue, at the Dissolution, was £38. 19. 7. This convent obtained celebrity from the pretended inspiration of Elizabeth Barton, one of the nuns, called "the Holy Maid of Kent," who, for denouncing the wrath of the Almighty upon Henry VIII., for his intended divorce of Catherine of Arragon, was hanged at Tyburn, with her confederate, Richard Deering, cellarer of Christ-Church." "By Saint Sepulchre's Nunnery was held the Beast Market, for the sale of Cattle..."
"On the right hand of the Dover Road, in the south-east suburb, not far from the nunnery of St. Sepulchre, stood the old Hospital of St. Laurence, of which there are now no remains save in the walls of cottages adjacent to the site." "The cemetery at St. Sepulchre, discovered during the present year (1861) in making excavations for the cellars of some houses about to be erected, has proved rich in antiquities. In this place had evidently been two distinct graveyards; one, about four feet below the present surface, was probably a general burial-ground attached to the nunnery, for the bodies were far too numerous for us to suppose the interments had been restriced to the former inmates of the Order; the other cemetery was a Roman one, found at a distance of five or six feet beneath the surface. Herein, the practice of urn burial had prevailed. The dead in the upper layer were so closely packed, that there was something ghastly in the process which laid open their remains. Rows of skulls with skeletons lying almost shoulder to shoulder, presented themselves to view. In these upper graves, there was vestige neither of coffin nor of shroud. Had the wood decayed, or had the dead been interred uncoffined? a practice much more common, I believe, a few centuries since, than is generally supposed, and which it appears prevailed in a great degree in the present case; as among the Roman remains below, vestiges of wood were found, and portions of chests or boxes which had contained some of the most delicate of the urns and fictile vessels. Sometimes the interments had intermingled; broken pieces of pottery occurring among the Christian graves, marking where the earlier deposits had been disturbed byt he sexton's spade. The most interesting relic perhaps of the whole colleciton,w as a little vessel of bright polished red ware; in form rare, if not unique, deposited perhaps to accompany some child to whom when living it was the means of administering nutriment; its height was four and a half inches. This relic was discovered about eighteen inches below the surface, as if throuwn up in digging the later grave; it had, fortunately for the antiquaries of the present age, escaped detection; it is figured it the Plate, No. 15. The handle is at quarter distance from the spout, the bore of which is so small, that the orfice would not admit more than an ordinary-size knitting needle. ...The interments whence these objects were taken seem to have been near, or intermingling with, a Roman cemetery, a not unusual occurrence ; the burial grounds of an older race of people offering obvious inducements for similar uses to the population which succeeded them. Indeed the practice has not been confined to Pagan races ; the churchyard of the nuns of the Holy Sepulchre, at Canterbury, was located over a thickly-occupied Roman cemetery, where the rites of cremation and urn burial had been practiced, whilst beneath the deposit of earthen and glass vessels, and broiue relics, were found more than one rudely-formed urn, composed of sun-baked clay, which indicated that the still older inhabitants of British soil, probably Beigic or Celtic tribes, had also held their funeral observances on the same ground. A Book Entitled: "The History and Antiquities of the Three Archiepiscopal Hospitals at and near Canterbury; viz. St. Nicholas, at Harbledown; St. John's, Northgate; and St. Thomas, of Eastbridge; with some Account of the Priory of St. Gregory, the Nunnery of St. Sepulchre, the Hospitals of St. James and St. Lawrence, and Maynard's Spittle. By John Duncomb, M.A., Vicar of Herne, and Master of the Hospitals of St. Nicholas and St. John; and the late Nicholas Battely, M.A. Vicar of Beaksbourn, and Editor of Somner's Antiquities of Canterbury." "...Juvat antiquos accedere fontes, Atque haurire......." London, printed by and for J. Nichols. MDCCLXXXV. Plates, W. View of St. Nicholas Hospital, Harbledown. Arthur Nelson del. 1766, 2 - Curious Maple Bown at Mapledown, W. View of St. John's Hospital, Canterbury, J. Raymond, del. 1784, Seals of Harbledown and St. John's Hospital. N. View of Eastbridge Hospital, Canterbury, taken from King's Mill, Raymond del. Cook sc. South View of Kingsbridge and Mill, and of the Church of All Saints at Canterbury, according to the late improvements taken (from the Parlour Window of the King's Head Inn), March 11, 1780. J. Pridden del. Seals of Eastbridge Hospital, &c. View of St. Gregory's Priory, Canterbury. Ruins of St. Thomas's Chapel, Canterbury, as they appeared in 1781. F. Perry del. W. View of St. Sepulchre's Nunnery, and N.E. View of Maynard's Spital, Canterbury. W. Groombridge del. 1785. Seals of St. Gregory's Priory, St. Maynard's Spital, &c.